Pups like to be pampered too! As with nail clippers, recent pet-care development has seen growth in popularity around the art of nail grinding for dogs. An alternative to the usual method of clipping, nail grinding is said to be much easier and safer. Pet care involves more than just a regular bath every so often. Like humans, dogs have nails that grow out and need frequent maintenance or they can become weak & rotten. This is why nail grinding is taking the world by storm. We decided to investigate. In this guide, we explore this notion of dog nail grinding and include a comprehensive review of two top market products. Use the pros and cons of each to select the best device for your dog. It’s time to jump on the bandwagon and keep your dog’s nails on trend. Let’s take a look! What Is Nail Grinding For Dogs? Dog nail grinding is actually a simple adaptation of conventional manicure grinding in salons. The idea was inspired by the mechanical tools that nail technicians use during the shaping of human fingernails. 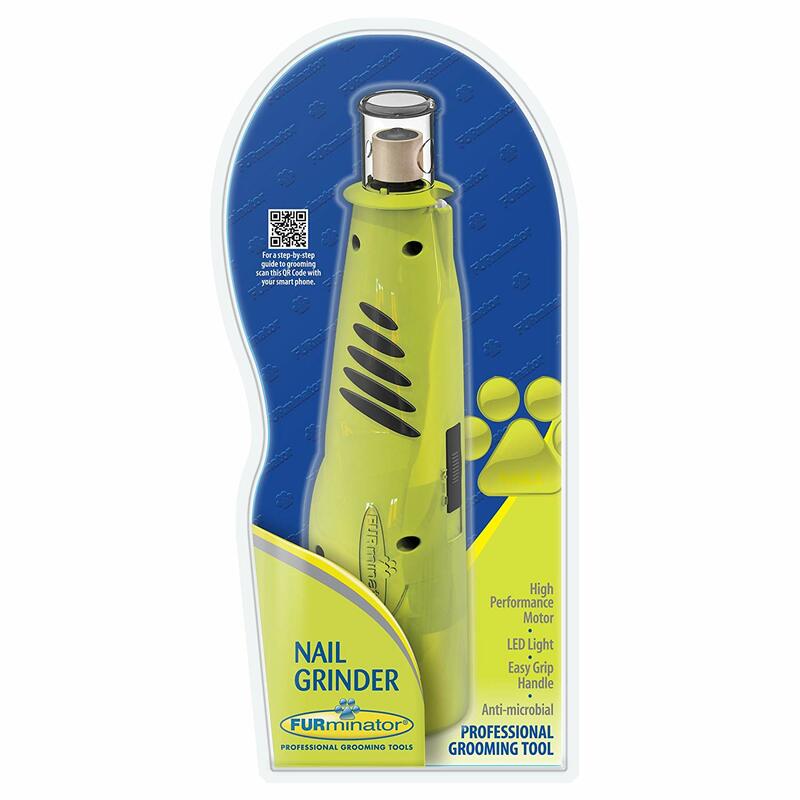 Nail grinders are tube-like devices featuring rotating, metal bits at the tips. The bit is usually in a cone or cylindrical shape and is made of a corrugated, rough exterior. When rotating, this exterior creates friction on any surface it’s put up against. Eventually, the surface will break down and disintegrate. This is the process of grinding. Where nail clippers literally clip away at the nail, the whole procedure of nail grinding can be compared to that of using sandpaper: slow, gradual grinding away of the overgrown nails. Nail grinders work electronically and usually offer two different speeds. The tips, or grinding bits, are sometimes adjustable. Thicker, harsher grooves work for the nails of bigger dogs. Lighter, less intense tips will be sufficient for the nails of smaller ones. Why Would You Want To Grind Your Dogs Nails? Keeping your dog’s nails at a suitable length is more important than you might realize. There are many health risks and implications that come with overgrown toenails. Dog nails need to be kept at a standard length and this can be done through the use of a nail grinder. Lameness: This occurs when the long nails tip the paw of the dog backward and blood flow is restricted. Dewclaws: When nails become too long and curve up into the flesh. Rotting: Old nails can hold bacteria and begin to rot over time. Limping: The inability to properly connect the paw with the ground results in an altered walking state. Bodily harm: Tearing open other parts of the body while attempting to scratch with too long nails. If your dog’s comfort and well-being is of even the slightest concern to you, then nail grinding should already be a part of your routine. It’s a sure step to making sure their daily lives flow as smoothly as possible. What’s more, it’s an investment in their health and future development. The repercussions that come with letting dog nails grow out too far are not worth the trouble. Take care of them before problems can arise. The idea of grinding away your dog’s nails might be enough to make your skin crawl. If this is the case, then don’t hesitate to seek the assistance of your vet. They’ll happily take care of the procedure so you don’t have to. 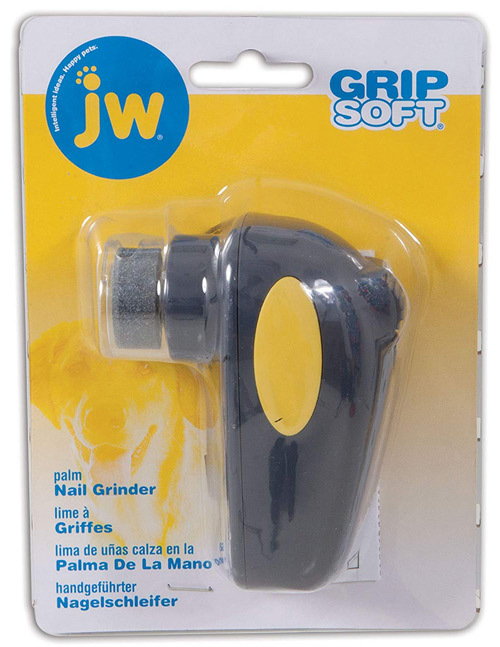 Regardless, the process of nail grinding is a pain-free one for your dog. There is no need to worry about this. However, if you’re comfortable enough to perform the task yourself there are a few safety measures you need to keep in mind. While using a grinder is easier than a clipper you still run the risk of damage should you grind too far. Dog nails are embedded with a central nerve in each. Hit this nerve with either a grinder or clipper and your dog is in for a painful, blood-filled mess. Now that’s enough to make our skin crawl! The trick is to ensure you don’t grind too deep. Familiarize yourself with the exact stopping point of each nail before starting. This way you’ll know exactly when it has gone deep enough. Hitting the nerve will cause more issues for you in the long run too. The next time you want to grind your dog’s nails they’ll remember the experience and are more likely to flee the premises than sit through it again. Before you begin, you also want to ensure that there is little to no hair around the target area. If your dog has long, shaggy hair be sure to push it all back. Dog hair runs the risk of getting tangled in the spinning top of the grinder. It’s not uncommon to trim leg and paw hair before beginning the grinding process, just in case. He will remember any kind of discomfort endured during a grinding session and make them less excited for the experience each time. Dry paws are essential for grinding safety. Dog nail grinders are electronic devices either powered by batteries or wall sockets. They are sometimes cordless and other times equipped with a long cord for portability. Because of their electric nature, it’s imperative that your dog is 100% dry when you use the nail grinder. Any excess water or moisture on the paws could create shocks which the animal will feel when he comes in contact with the rotating metal bit. The bit is a conductor of electricity and your dog’s nails can absorb this sensation. Because the devices are usually so small, it’s unlikely you’ll even realize you’re repeatedly shocking your dog through their nail beds. Depending on the temperament of your animal, the experience of grinding will either be a pleasant or fearful one. When working with an animal who becomes naturally triggered by the experience, you’ll face the challenge of getting them to sit still for the procedure. Dogs usually get triggered upon hearing the vibration of the device when switched on. Attempt to make the experience less intense by providing treats before, during and after the grinding session. You can also turn on the device, provide a treat, and turn it off again. Repeat this process a few times until it’s clear to your dog that the sound promotes the presence of treats instead of fear. Bear in mind that nail grinding creates heat due to continuous friction. The heat can sometimes be overwhelming for the animal in question as it’s particularly unusual to them. Be prepared to take regular breaks between grinding in order for the heat to subside and comfort to be regained. Adjust your pace according to the reactions of your dog. If they’re clearly disturbed then consider longer breaks. Step 1: Hold your dog securely with one paw extended in your hand. Hold the grinder in your dominant hand. Allow the dog to settle comfortably so that there is no resistance or strain. Step 2: Do one nail at a time. Touch the rotating tip to the nail and slowly bring it back toward the adjacent end. Work this way back and forward. Step 3: Repeat step 2 until the sharpness of the nail is gone. Step 4: When you’re happy with the length, start moving the tip in a circular motion as opposed to back and forth. This will polish and smooth out the nail. Step 5: Repeat steps 1 to 4 on all nails. There are some notable benefits to maintaining a regular pet care schedule. Spending some time with your dog every two weeks to grind nails, brush teeth, and groom fur makes a huge difference to their well-being and your bond as pet & owner. We know you care very deeply about the emotions of your pet. A grooming regime that takes care of their nails is a sure road to happiness for any animal. Knowing that your dog will be able to roam comfortably thanks to your grinding techniques is a worthwhile investment. If you can manage to perform the grinding safely on each nail, then the whole experience will be one based on bonding instead of fear. In turn, creating happiness for you too since you don’t stress about the process any longer. Practicing to get this right is a good plan for excellent long-term results. Health should be the most important reason to grind your dog’s nails. Allowing any animal to develop limps, sensitivity, or altered growth patterns due to overgrown nails is simply unacceptable. Even being unable to scratch itself due to nails being too long is pure torture for a dog; not to mention when scratching becomes unavoidable and the skin is penetrated in the process. Human beings made the decision to tame these animals so we should take up the responsibility to look after them properly. Nail grooming is one of these tasks. Treat is as if the health of your pet is at risk… because it is. There is constant debate among the dog owner community as to whether clipping or grinding is better when tending to nails. As you now know, grinding is using an electronic device to file down the nail using friction. Alongside this, we have clipping. Clipping involves scissor or plier-like tools in which there is a cylindrical gap at the end. The nail is placed inside of this cylinder and when pressure is applied the device clamps down & snips off the end of the nail. The snipping point is decided by the cutter. As with grinding; too low and you’ve hit the painful nerve. In our opinion, grinding remains the clear favorite. In spite of the buzzing noise, it’s still the safest method of grooming. Eliminating the risk of hitting that main, bloody nerve is worth a bit of dust you’ll have to wipe up. Of course, much of selecting the best option for your dog relies on his or her character. Should your furry friend be deathly afraid of loud noises then a clipper may be your best bet. Where possible, make use of a grinder. The smooth edges and self-shaping is something you just can’t achieve with everyday clippers. In search of the perfect nail grinder, we explored all corners of the market. 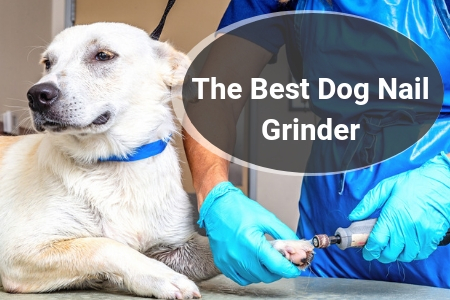 From cordless to electric to battery-powered models, we sifted through the spectrum in order to recommend the best nail grinder for your dog. 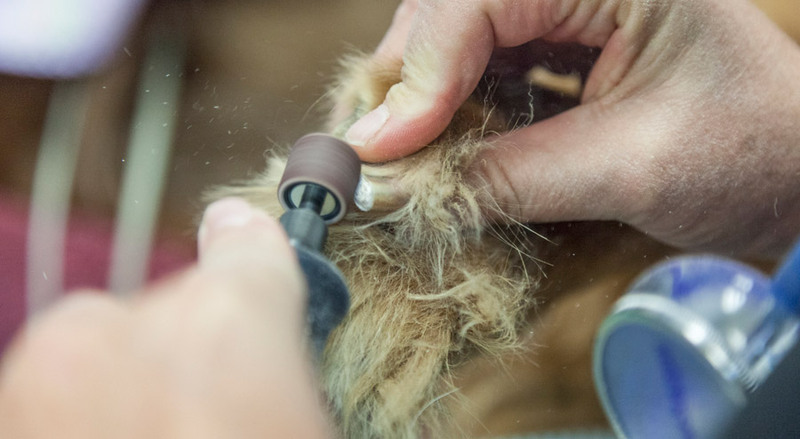 We narrowed it down to our two top picks and market leaders: the Furminator & the JW. We love that both of these brands are the tried and trusted industry leaders when it comes to nail grinding. They keep dog well-being at the forefront of their products with quality and performance to match. The great thing about both of these nail grinders is that they’re made to last. Both brands’ products will be investments when one considers the lifespan of each device. While there may be cheaper options on the market, we always recommend spending a little extra when it comes to items of health care. Indirectly, this is essentially what nail grinders are. They’re items that maintain the good health of your pet in a way they can’t manage themselves. Ready to help your four-legged friend? Let’s take a closer look at both the Furminator and the JW. We have compiled a comprehensive review & breakdown of each product. We have also included a list of pros and cons for each for a quick comparison during your selecting process. The great thing about this device by Furminator is that it’s made from pure anti-microbial plastic. This assists in keeping the spread and growth of germs & bacteria to a minimum. You’ll have less risk of personal contamination with bacteria found living on your dog’s paws. The grinder features two speeds and two interchangeable heads. This means it’s compatible with all dogs and can be adjusted to suit the nail size & strength as necessary. We like that this grinder is cordless and powered by batteries. This makes it fully portable and able to use anywhere. There is also a handy LED light that assists with precision grinding, even in low light. This is a trusted product by many in the industry including vets and dog grooming services. Making use of this device every three to four weeks will suffice for excellent grooming and even bonding sessions between you and your dog. This little device by JW is the more affordable counterpart to the unit by Furminator. Also designed as a portable device, the JW is battery-operated and fully portable. It also features a LED light for harder to see scenarios. We love the size of this unit as it fits perfectly in the palm of one’s hand. Its compact nature makes it easy to travel with and have handy in the event of an emergency. If your dog hurts itself and a nail gets torn you can grind it down before it snags on anything, causing more pain. Slip it into the bottom of your handbag while out and about. The guard has holes in it to prevent accidental hair winding, so it’s very practical. The JW has two different speeds and two adjustable head bits that allow its use on any size dog. The device is easy to use and relatively quiet when compared to other units of this nature. There are just some things that your dogs will never be able to do for themselves and nail grooming is one of them, which means you have to step in and take care of it. There is little to no need for this task to become a stressful one, nor is it necessary to visit a vet every time your dog needs his nails cut. At-home DIY nail grinding is an effective and easy method of dog nail care. You can start today by investing in a portable nail grinder and learning the basics of the procedure. 1 What Is Nail Grinding For Dogs? 2 Why Would You Want To Grind Your Dogs Nails?